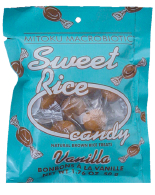 Natural Import Company - Traditional Japanese foods - Mitoku Vanilla Taffy Candy - 1.76 oz. Mitoku Vanilla Taffy Candy - 1.76 oz. Ingredients: traditional rice malt (whole brown rice, sprouted barley, spring water), natural vanilla essence. Mitoku Vanilla Flavor is a hard-style taffy. It is our number one bestseller. Handcrafted and irresistible!